Have you ever decoupaged with fabric? It's awesome because we all know fabric comes in ENDLESSLY cute options! Anyone else a fabric hoarder? Listen, there's no shame here. This is our safe place. I picked up an unfinished wooden box at the Target dollar spot (ahem, it was $3...what the heck, Targ??) and knew it had potential. 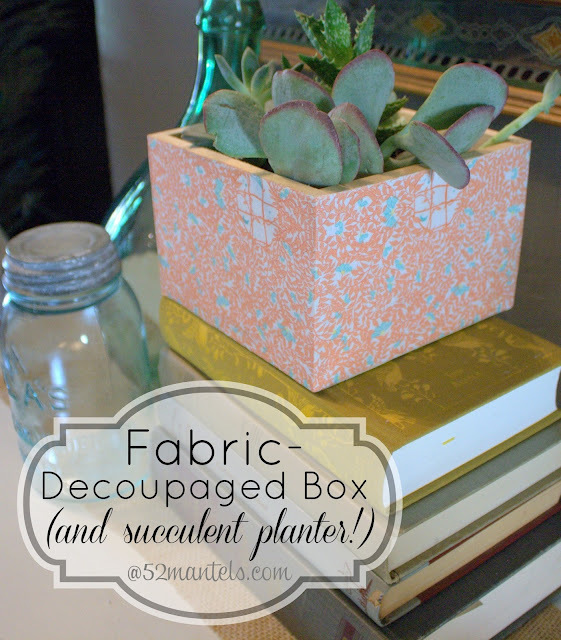 Enter this fabric-covered succulent planter box! (that's a mouth-full, I know). 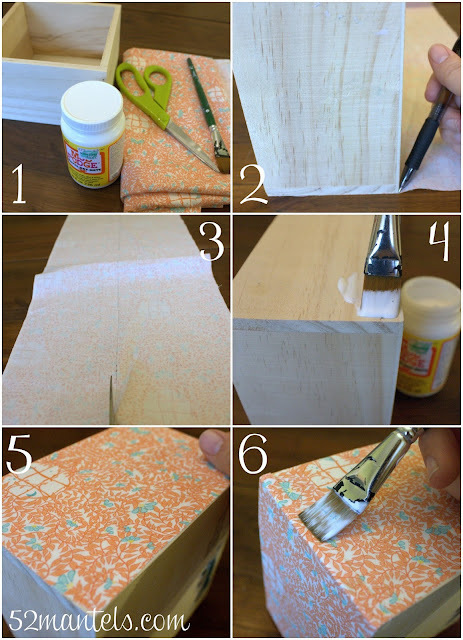 2) Use box as a template to cut fabric to size (overlapping end by 1/2") and mark with a pen. **tip: use the selvage side for the top of your box to eliminate fraying! As you can see in the photos, I did not pre-paint my wooden box. If you don't love unfinished edges, paint them (and let them dry!) prior to attaching your fabric! Did you notice I didn't drill a drain hole in my planter box? Why? Well...because, I'm lazy. And, I may want to fill my box with something else later on down the road. 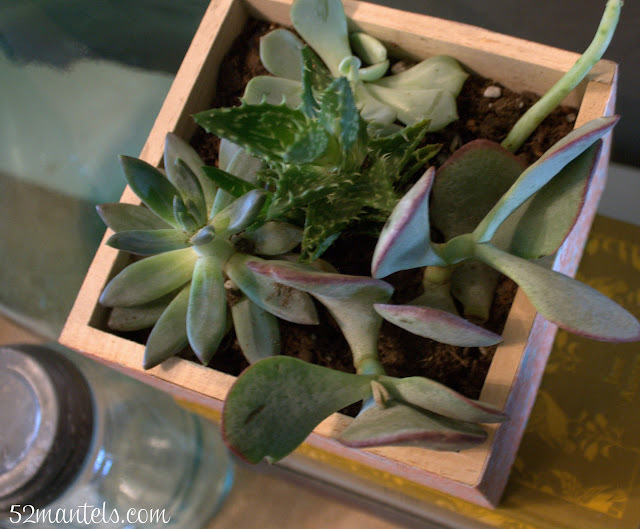 And, I never put my succulents in draining containers, anyway (as you may remember from my Easter table). And, it always works out fine for me. BUT...if you're a plant guru and this is freaking you out, by all means, drill a drain hole or two. So, there you have it. My undraining, succulent planter! Pretty, don't you think? I love the succulent too! Emily, this project is great...I LOVE it! Pretty! Succulents are the best! Where have they been all my life?! So cute!! I think succulents are so pretty!! Love it!! 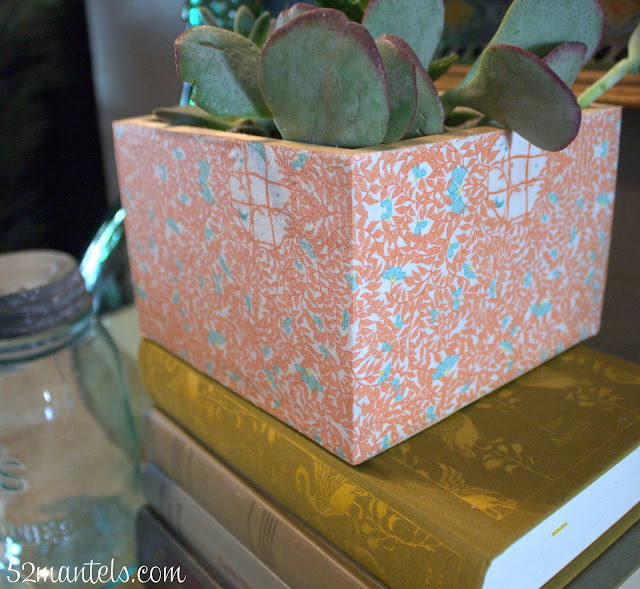 Fabric and succulents... in love! Thanks for sharing! I've never thought of using fabric to cover a planter - fantastic Idea. It turned out so pretty! Love this project! I've yet to decoupage fabric! Oh, Katie-- you totally should!! It's fun! I love the fabric you chose for this project...simply gorgeous! Thanks!! It's one of my faves too. I love orange and aqua! So cute! I love succulents! !